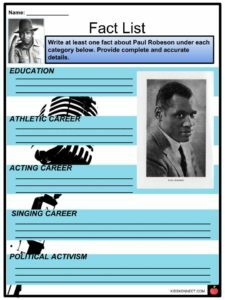 Paul Robeson was a famous African-American singer, actor, civil rights activist, and star athlete. 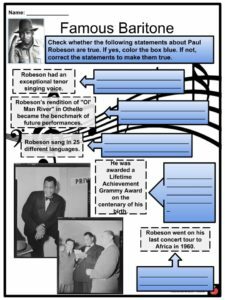 Paul Robeson was a famous African-American singer, actor, civil rights activist, and star athlete. He was known for his theatrical success, political activism, and his participation in the Harlem Renaissance. 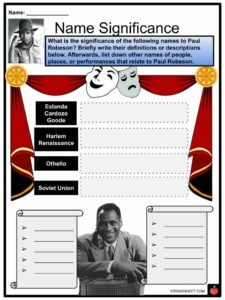 See the fact file below for more information on the Paul Robeson or alternatively, you can download our 23-page Paul Robeson worksheet pack to utilise within the classroom or home environment. Paul Leroy Robeson was born on April 9, 1898 in Princeton, New Jersey. 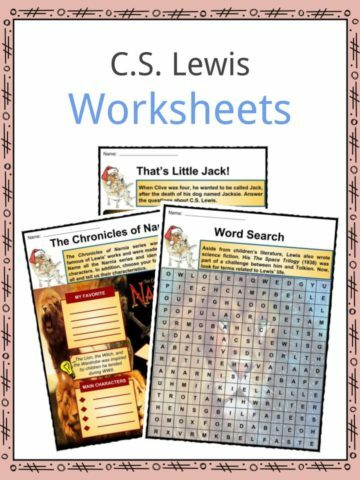 He was the youngest of five children of Reverend William Drew Robeson, who was a former slave, and Maria Louisa Bustill, who was born into an abolitionist Quaker family. In 1915, Robeson became the third African-American student to enroll at Rutgers University, in New Brunswick, New Jersey. He was the only black student in his batch. He received a four-year scholarship in college and became a two-time All-American football player. He became a member of Phi Beta Kappa. He graduated as class valedictorian and moved to Harlem after graduation. From 1919 to 1923, Robeson attended Columbia Law School, where he met his wife Eslanda Cardozo Goode, the first African-American woman to be the head of a pathology laboratory in New York. Robeson briefly worked for a law firm but eventually left because of racism and pursued theater and music instead. Using his artistic and musical talents, Robeson began to promote African-American culture through his performances. He joined New York-based theater group Provincetown Players, and got a role in the play All God’s Chillun Got Wings by Eugene O’Neill in 1924. He next starred in the title role of The Emperor Jones in the play’s 1925 revival in New York and London. The Emperor Jones was adapted for a feature film in 1933 starring Paul Robeson. Besides his acting skills, Robeson had exceptional bass-baritone vocal talent. He performed his first vocal recital of Black Spirituals in 1925. 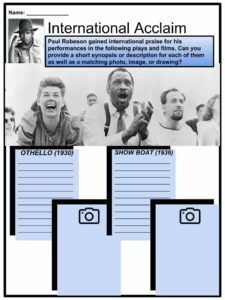 One of the highlights in Robeson’s career was his role as “Joe” in the musical play Show Boat where his rendition “Ol’ Man River” is still considered the top standard now. 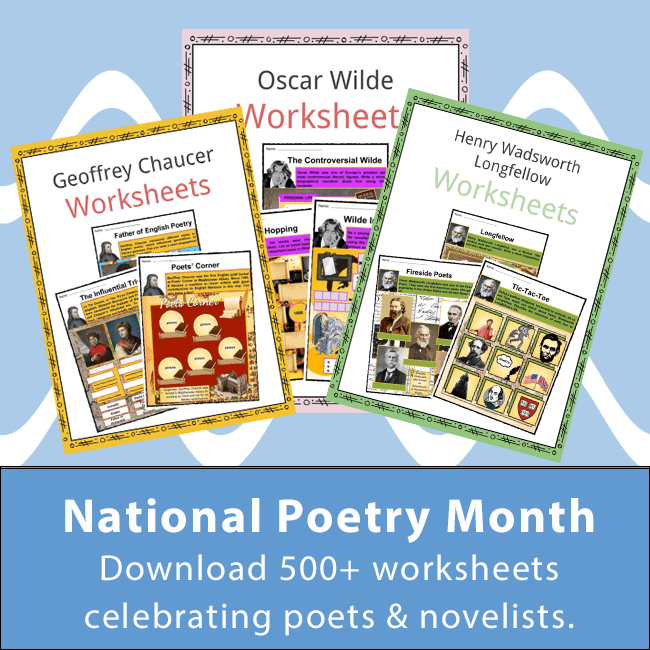 He earned international praise for his performance of the title role in Othello in London in 1930 and on Broadway in 1943. He was the first African-American to star as Othello on Broadway. He continued to use his unique baritone voice to benefit social and labor movements and promote African culture. He sang for peace and social justice and toured throughout the United States, Europe, Africa, and the Soviet Bloc. 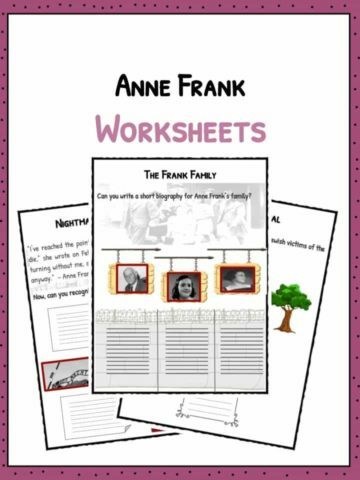 In 1933, he donated the proceeds of “All God’s Chillun Got Wings” to Jewish refugees fleeing Germany at the time of Hitler. Following the outbreak of the World War II, he premiered in Earl Robinson’s Ballad for Americans in 1939. 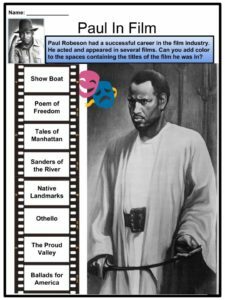 Robeson also acted in films, namely Sanders of the River (1935), Show Boat (1936), Song of Freedom (1936), and The Proud Valley (1940) with special appearances in the documentary Native Land (1942) and the film Tales of Manhattan (1942). 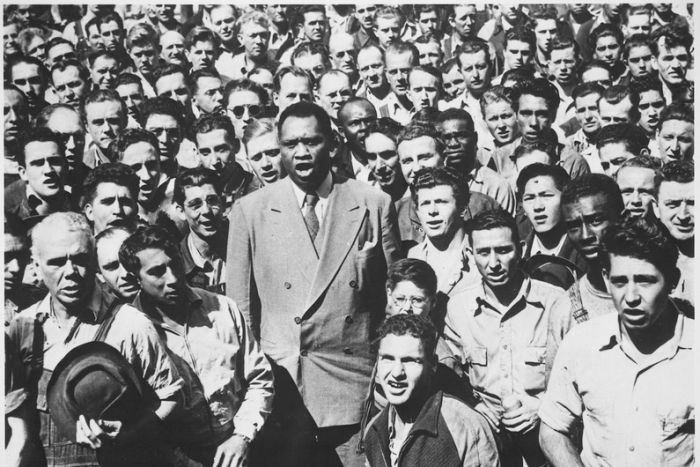 As Robeson’s social and political awareness increased, he visited the Soviet Union in 1934. 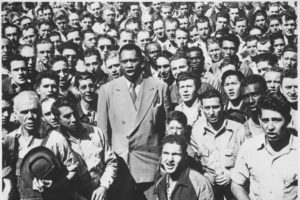 During the 1940s, Robeson’s international performing career was partnered with his political activism. He was active in advocating for peace and civil rights. He openly spoke out against racism. He performed and spoke at rallies and conferences in support of organized labor. In 1945, he was the head of an organization that urged President Truman to support an anti-lynching law. In 1950, the US State Department revoked his passport because he declined signing an affidavit denying membership in the Communist Party. He also got blacklisted after he appeared before the Joseph McCarthy’s House Un-American Activities Committee. Robeson moved to Europe and traveled in countries in the Soviet Union. He got his passport back in June 1958 and returned to the United States in 1963. In 1945, Robeson was awarded the NAACP’s Spingarn medal. In 1978, the United Nations General Assembly posthumously awarded Robeson’s efforts to end apartheid in South Africa. In 1995, he was inducted into the College Football Hall of Fame. 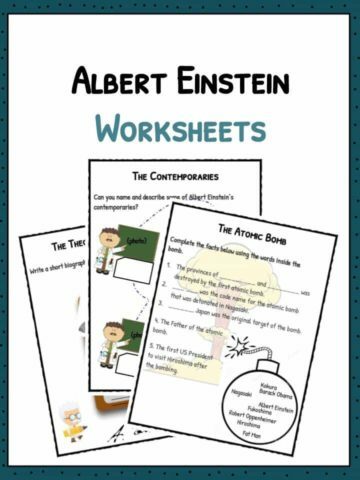 He was awarded a Lifetime Achievement Grammy Award on the 100th year of his birth. You can see his star on the Hollywood Walk of Fame. Robeson’s autobiography entitled Here I Stand was published in 1958. Robeson went on his last concert tour to New Zealand and Australia in 1960. He retired in 1963 due to ill health and began to live privately. At 77 years old, Robeson died on January 23, 1976 in Philadelphia. 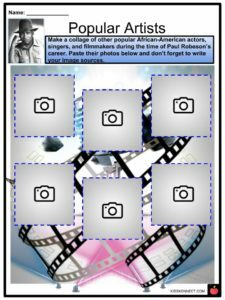 This is a fantastic bundle which includes everything you need to know about Paul Robeson across 23 in-depth pages. 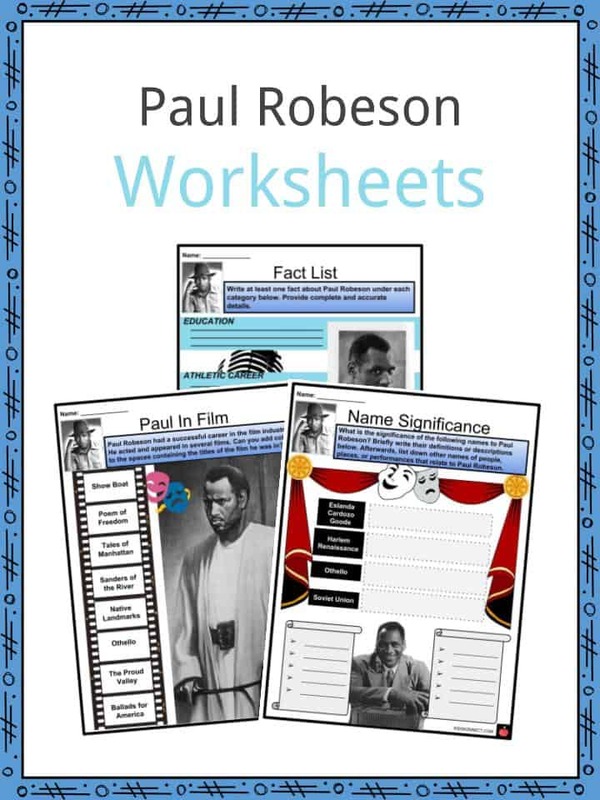 These are ready-to-use Paul Robeson worksheets that are perfect for teaching students about Paul Robeson who was a famous African-American singer, actor, civil rights activist, and star athlete. He was known for his theatrical success, political activism, and his participation in the Harlem Renaissance.